Macular degeneration is the leading cause of irreversible blindness in the US today, and by 2030, it is estimated that as many as 30 million Americans will be diagnosed with this condition. 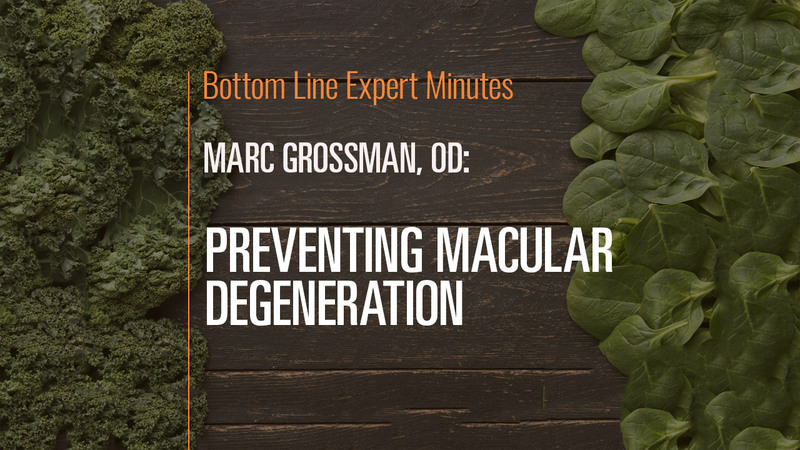 In this video, Marc Grossman, OD, LAc, holistic developmental/behavioral optometrist and licensed acupuncturist, talks steps to prevent macular degeneration. This condition cannot be treated with surgery or medication, but food and supplements can help. Studies have shown that supplementing with as little as 6 mg of lutein a day can cut the risk for macular degeneration by 40%. Foods rich in lutein include kale and marigold flowers. Additional recommended nutrients include zeaxanthin and bilberry. For eye health, includes in your diet kale, collards, spinach and other leafy greens and orange peppers. Also, photo-oxidation from sunlight can break down blood vessels in the eye, so always wear sunglasses that protect against UVA, UVB and blue light to prevent macular degeneration.